Chris is a Scottish comedian who has been professionally entertaining since the age of 18. Starting his working life as a holiday camp performer, he quickly realised he couldn’t sing or dance (it took him six years to figure that out) he then turned his eye to Stand-Up Comedy and has never looked back. You can find him performing at the biggest comedy clubs throughout the UK and at all the major festivals globally. He is cheeky, charming and insightful. 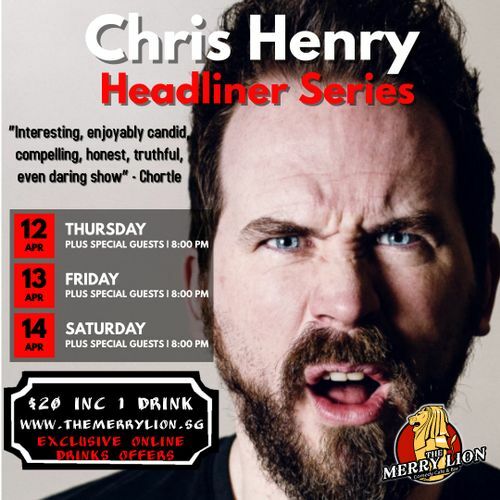 If you see Chris Henry’s name on a comedy bill you know you are in for a treat. Plus rising stars of the local Singapore scene and resident host Scott Mitchell.